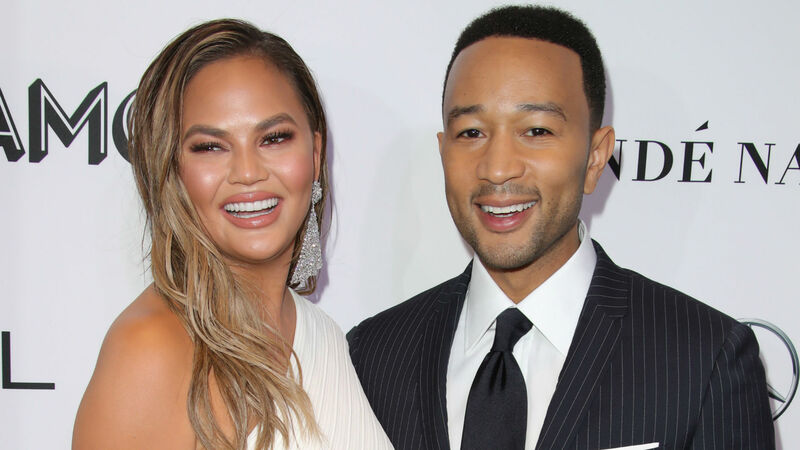 Leave it to Chrissy Teigen and John Legend to host a Grammys party celebrating the 61st Grammys Awards that was super-low-key, but also beyond epic. The celebrity couple chose to chill at home for the evening rather than get all dolled up and attend the actual event. At first, their viewing party might not sound as exciting as being at the big night, but once you see footage from it, you’ll probably wish you’d watched the major music award show with them — and their famous friends. How good is that? She was beyond happy with herself, as Teigen replied to her own tweet, “I’m so proud of this.” As she should be, especially since she found a way to mention Legend’s EGOT status and call him lazy at the same time. Don’t worry; their evening didn’t consist of Legend sleeping. Not only did Teigen give “not-going-to-the-grammys makeup tutorials” on her Instagram Story, but they watched the Grammys like many of us did — from the comfort of their own home. That said, Teigen and Legend did invite a few famous individuals over to their Los Angeles pad to hang out, like celebrities do. It was quite an interesting group, and one you might not expect from the couple. And no, their guest list didn’t include New York congressperson Alexandria Ocasio-Cortez. However, they did invite Modern Family star Jesse Tyler Ferguson and his husband Justin Mikita, The Good Place‘s Jameela Jamil and comedian/writer Neal Brennan (Chappelle’s Show). Good thing that didn’t happen, because then fans wouldn’t have seen Ferguson adorably dancing with baby Miles. Or the amazing cake Twitter gifted Teigen. Or Brennan explaining what he hates most about musicians. Or Jamil going straight from the Grammys (yes, she attended with her boyfriend, James Blake) to Teigen and Legend’s home to drink some tea and help her friend with her hiccups. BTW, who knew these two were so close? We are so here for this friendship. Let’s all thank Teigen for capturing what turned out to be a memorable evening. Even when Teigen and Legend are just being average people watching an award show from home, they still somehow turn a mundane act into something so spectacular and entertaining.